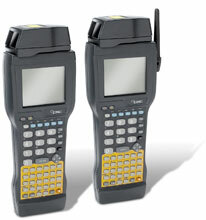 The Datalogic Falcon 325 has been discontinued. No direct replacement is available. Rugged enough for the warehouse, but ergonomically designed for ease of use. Fast, accurate, customizable, real time Automatic Data Collection - this is the need of today's businesses striving for greater efficiency, productivity and cost-effectiveness. The Falcon 325 by Datalogic is the answer. Open standards, powerful applications, and ease of use allow these portable data collection terminals to integrate seamlessly into the supply chain of companies involved in logistics, manufacturing, retail, warehousing and distribution. Rugged enough for the warehouse but ergonomically designed for ease of use, the Falcon 325 offers a 16-line screen, 486-class processor, 33 MHz operating speed, integrated scanning and a user-accessible PC Card slot. Their open architecture affords easy application development. And the Falcon 325 is available with PowerNet Twin Client to support VT100 VT220 HP700/92 IBM 3270 and 5250 terminal emulations with screen formatter allowing swift and simple integration into your existing legacy system. While the Falcon 320 provides ideal batch data collection solutions, the Falcon 325 wireless data collection terminal is particularly ideal for data collection throughout the supply chain where real-time access to data is required. Our 2.4 GHz spread spectrum radio terminals have raised the bar in information management data collection allowing information to be transmitted instantly in real-time without the use of wired connections. Portable Data Collection Terminal Solution Fast, accurate, customizable real time Automatic Data Collection –this is the need of today 's businesses striving for greater efficiency, productivity and cost-effectiveness. The Falcon 325 by PSC is the answer. Open standards, powerful applications and ease of use allow these portable data collection terminals to integrate seamlessly into the supply chain of companies involved in logistics, manufacturing, retail, warehousing and distribution. Rugged enough for the warehouse, but ergonomically designed for ease of use, the Falcon 325 and 325 offer a 16-line screen, 486-class processor, 33 MHz operating speed, integrated scanning, and a user-accessible PC Card slot. Their open architecture affords easy application development. And the Falcon 325 is available with PowerNet Twin Client to support VT100, VT220, HP700/92, IBM 3270 and 5250 terminal emulations, with screen formatter, allowing swift and simple integration into your existing legacy system. While the Falcon 325 provides ideal batch data collection solutions, the Falcon 325 , a wireless data collection terminal, is particularly ideal for data collection throughout the supply chain where real-time access to data is required. Our 2.4 GHz spread spectrum radio terminals have raised the bar in information management data collection, allowing information to be transmitted instantly, in real-time, without the use of wired connections. With the international quality standards set by ISO 9000, Computer Integrated Manufacturing (CIM), Just In Time (JIT) and Total Quality Control (TQC), companies are required to have documented procedures and effective automated data capture applications, such as inventory control, work in progress, labor tracking, receive-putaway and pick-ship systems. The aptly named Falcon soars in this tough environment.